The Queen is set to launch an official Royal Family Facebook page later this week. Regular updates on what the British Monarchy is up to will be put on the new Facebook page. Buckingham Palace has issued a statement to confirm the new Facebook page, plus to stress that the page is not a personal profile page for the queen. 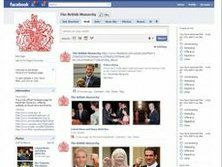 The new British Monarch Facebook page follows official Royal Family Twitter and Flickr feeds which launched earlier this year and back in 2009, respectively. A Royal YouTube channel also launched in 2007. The Queen's new Facebook page is set to feature the Court Circular, which is a full record of the previous day's official engagements. The Facebook updates will also keep the citizenry informed of official royal events and ceremonies, which will you be able to search on a map of Britain. You will be able to virtually befriend and give the Queen a royal poke when the new official British Monarch Facebook page launches later this week.